Do You Need a Driver's License to Operate a Forklift? Do You Need a License to Drive a Forklift? Regardless of the type of forklift you use on the job, thorough training required to drive a forklift in the United States. That’s where CertifyMe.net helps – we have an assortment of training packages designed to get you certified to operate a forklift – safely, efficiently, optimally. With our affordable prices, comprehensive course content, and outstanding customer support, CertifyMe.net is the leader in online forklift certification. Do you need a driver’s license to operate a forklift? Yes, but there’s some confusion as to what type of license is required. CertifyMe.net will help your employees get the right driver’s license to run your forklifts. Is a Driver’s License Required to Operate a Forklift? Per OSHA requirements, a commercial driver’s license (Class A, B, C, etc.) is NOT required to operate a forklift. Many employees think that it’s necessary to first obtain a vehicle driver’s license, but that’s not the case. While most people who work in a warehouse, distribution center, factory, construction zone, and other job site that uses forklifts already have a driver’s license, it’s not a deal breaker for OSHA. However, just because a regular driver’s license isn’t required to operate to a forklift, there are still OSHA requirements related to driving forklifts. While a driver’s license is not a prerequisite to operate a powered industrial truck (including regular lifts, heavy duty forklifts, pallet jacks, etc. ), another question remains: do you need a forklift license to operate a powered industrial truck? Do You Need a Driver’s License To Operate A Forklift? The question remains: do you need a driver’s license to operate a forklift? Once you’re complete with the training, you can print your forklift license right away – no waiting for official documentation to arrive in the mail. Your forklift license is good for three years, at which time you can use our free 3-year renewal training to re-certify. It’s as simple as that. 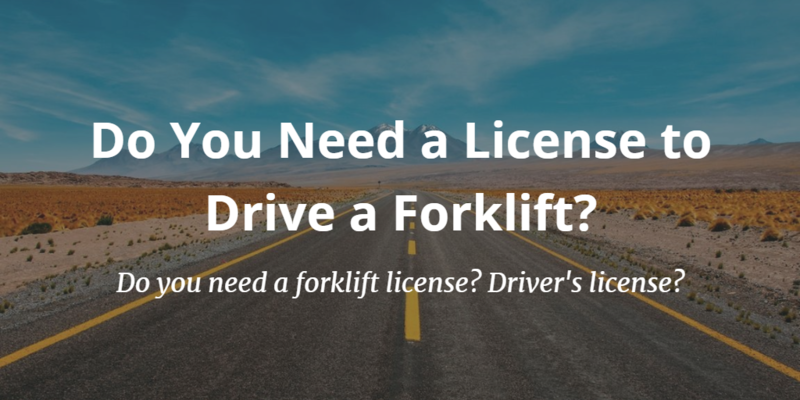 Do you need a license to drive a forklift? Yes. Is it difficult to obtain one? No. Thanks for CertifyMe.net, the leader in online OSHA forklift training, we’ve made it easier and more affordable to get a forklift license than ever before! Register today with CertifyMe.net. In just a few minutes, you’re able to login to your training course, keep track of your employees’ OSHA certifications, and much more. To browse our complete line of 100% compliant forklift training courses, click here. You do need a forklift license to drive a forklift. And CertifyMe.net will help your company in this regard – contact us today! For questions about a forklift license from CertifyMe.net, give our OSHA experts a call at 1-888-699-4800. Thanks for visiting CertifyMe.net!